Apple's upcoming iOS 11.3 software update, the first beta of which was seeded to developers on Wednesday, finally adds the small but useful ability to sort App Store reviews on the iPhone, iPad, and iPod touch. 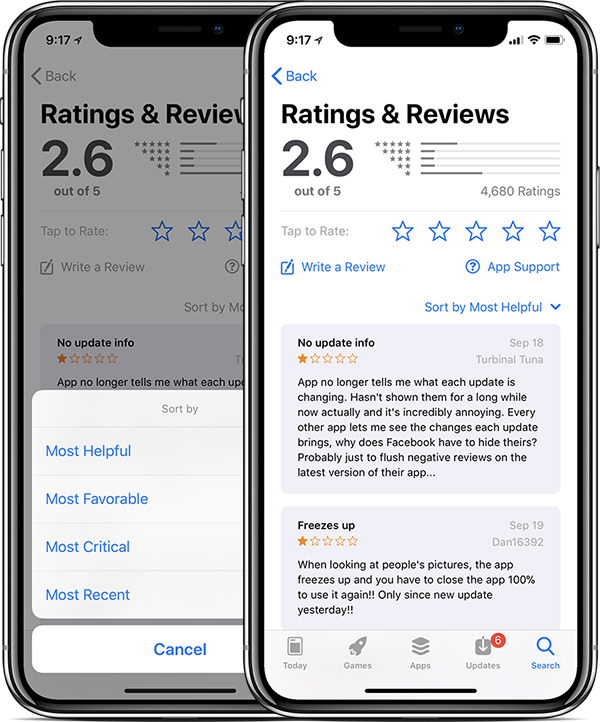 After tapping on See All under the Ratings & Reviews section in the App Store, users can now sort the reviews according to four categories, including Most Helpful, Most Favorable, Most Critical, and Most Recent. Most Helpful shows reviews that have received the most "Helpful" feedback from other users. Any user can designate a review as "Helpful" or "Not Helpful" by deeply pressing the text bubble via 3D Touch. Most Favorable shows reviews with the highest ratings, starting with five stars. Most Critical shows reviews with the lowest ratings, starting with one star. Most Recent shows reviews in reverse chronological order, with the most recently submitted reviews appearing first. There is no way to sort App Store reviews on earlier versions of iOS 11, so this is a welcomed change, especially considering the App Store was showing old, irrelevant reviews from as early as 2008 for some users. On earlier software versions like iOS 9, reviews could be filtered based on the latest version or all versions of an app, but these sorting options were removed when the section was streamlined on iOS 10 and later. iOS 11.3 is currently in testing for developers, with a public beta to follow soon. The software update will be publicly released this spring. It's comical that it only took 10 major OS releases for Apple to add review sorting. I'm not counting the first version of iOS since it didn't have an App Store. Why did it take so long to implement this? Only 12 yrs, sometimes I will read reviews but not being able to sort them was crazy. Technically It didn’t take all those years, iOS 10 (and earlier) at least let you sort them by latest app version. iOS 11 then removed the feature and broke it on previous releases as well. I’m just glad I don’t have to read reviews from 7 years ago anymore. NOT good enough, and it's just another example that Tim Cook & Phil Schiller are either Clueless or Incompetent ! The main issue is the Rankings algorithm used in the iOS and macOS App Stores. If Apple won't fix it, they at least need to offer Users the ability to filter-off (certain) Ratings themselves. For example, Users should have the ability to always view the "Rankings STATs" from the most-recent 1K Ratings or so, as well as view the Rankings STATs from ONLY those Users who have actually used the app within the past 30-60 days. Most Ratings in Apple's App Stores are incredible Stale, and from Users who haven't Used the particular app in many months, or years. In fact, MOST Ratings in the App Store are one-shot Ratings ... the User used the app, Rated it, and moved away from the app, never to use it again ... such Ratings MUST be DE-valued OR better yet, removed entirely from the Rankings algorithm results, UNDER the control of the User. The "weight" of Ratings should diminish by 1/6 every month, for the first six months, until it reaches zero, if a User hasn't used the app ... this way, Retention is baked into the Rankings algorithm !!! The plus side of this is that App Developers will then focus on Retention, and developing better apps ... NOT Rocket Science, but Apple appears incapable of doing it on their own ... haven't a clue why, though. I give Apple a D- grade for their latest App Store changes ... too little, AND way too late ! I would even be happy is Apple would simply offer the added capability one day per week, say Wednesdays, as a starting point to see how it all works out ... if they did (even) that, they may be very surprised at what happens. It's puzzling beyond belief that ten years out the App Stores are still catastrophically broken, and Apple, for whatever reason, is incapable of fixing it. The ONLY ones who praise Apple's App Stores are the so-called Pro Stock Analysts, none of whom have any real-world experience when it comes to the App Stores ... the entire lot of them should be Fired ... they're as bad as Tim Cook pretending to know anything about Coding ! Finally. The long awaited feature that users asked since the first iOS. Thank you Apple. Really nice to see this - I find it very desirable - you can now tell if something is wrong with the recent release (and you might not want to install it) or if something got fixed and review numbers suddenly went up. Should have been there from way back, but its nice to see Apple grabbing little details and nitpicks like this. Ironic that a company whose roots are in an app called Finder is so terrible sometimes at helping users find certain things. I hope this means they will finally let us filter the search results too, that way you can only show paid apps, only free apps, apps from certain categories, sort results by most recently updated or most popular, etc..
Something simple, very useful and common elsewhere finally making it to the App Store. I remember being able to sort reviews on my iPad on iOS 10 and earlier, but don’t remember being able to do it on my iPhone. Looks like this gives us both. I was annoyed when they removed it in 11 and I don't even have an iPad. Though this has more options than the old one on iPhone did, it only let you sort by app version. Also can we stop with all the hidden commands? How is that intuitive UI? Just like in the control center you can long press instead of 3D Touch to access the hidden options. You don't even need 11.3 to do it.